Microsoft Edge is the new browser that comes standard on your Windows 10 laptop. You can manage your browsing history or view your reading list with just a few clicks. If you went to a site recently and want to return there again but can’t remember the name, you might check your browsing history in the Hub to find it. 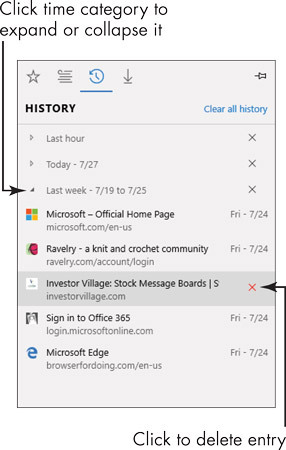 In Microsoft Edge, click the Hub button in the address bar and then click the History button (with the clock face on it) in the Hub pane to display the History list. As the History list accumulates items, it groups them by date, such as Last Hour, Today, and Last Week. You can click any of the time category labels to expand or collapse the entries in the group. Once you’ve expanded the desired time category you can click an item to go to it. The History pane closes. To delete a single item from the History list, move the mouse pointer over it, and click the Delete (X) that appears at the right. You can also right-click the item and click Delete. To remove all the history items, click the Clear All History link at upper-right in the History pane. You can pin the Hub pane open temporarily by clicking the Pin This Pane button (with the pushpin on it) in the upper-right corner of the pane. Click the Close (X) button that replaces the pin button when you want to unpin the pane. Finding your reading list items works like using favorites and your browsing history. 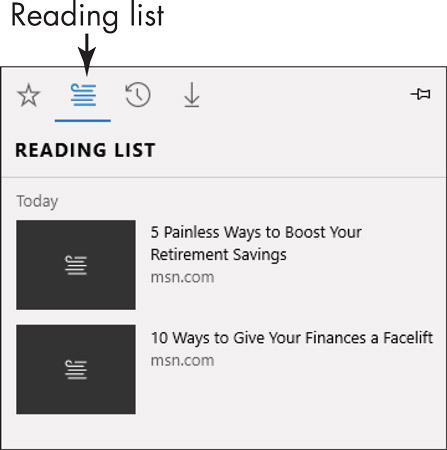 Open Microsoft Edge, click the Hub button on the address bar, and then click the Reading List button (with a stack of papers on it) in the Hub pane. In the list that appears, click the item to read. The Hub pane closes, and the reading list item opens in the current tab.